My mom is the best! She made me the most beautiful quilt for my birthday this year. Let me just say she has only started making quilts just a couple years ago and even though she has always been a wonderful seamstress, she mastered the quilt thing very quickly! 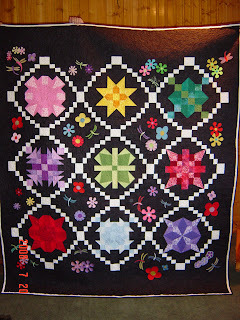 This particular quilt was a huge surprise because at least a year ago, I was watching a random quilt show one Saturday morning on PBS and I saw a flash of a quilt in the background hanging on the wall that I loved! I tried to tell my mom about it, but we could not find a copy of the episode without buying the DVD set of the whole season of this show! So we did, and she got to briefly see the quick seconds they showed this quilt I loved. They did mention the name of the lady who designed it, so unknown to me, my mom has been searching for the pattern since early in the spring! 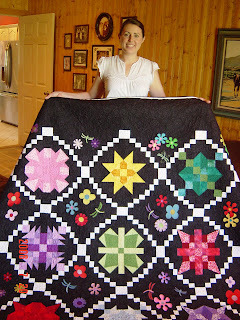 She said she searched and searched until she finally found the pattern online and ordered the book, then she began to make the quilt which took a while, but turned out BEAUTIFUL! I love it and never really thought I would actually get this quilt when I saw it last year! Thank you, Mom!!! !